Sometimes it pays to be the youngest child. Trina Choontanom, a senior computer science and engineer major, credits her two older sisters for sparking her interest in the field of computer science. But when it came time to pick a college major, Choontanom couldn’t decide if she wanted to go into computer science or computer engineering. Luckily, UC Irvine made the choice easy by offering the Computer Science and Engineering major (CSE). Offered jointly by the Bren School of ICS, the first independent computer science school within the UC system, and The Henry Samueli School of Engineering, the Computer Science and Engineering major gives students access to multidisciplinary problems with a focus on total systems engineering. Choontanom, a San Bernardino native, hadn’t taken any computer programming classes until she set foot on UCI’s campus. “The curriculum of the International Baccalaureate (honors) program at my high school didn’t have any computer related classes and there was no chance to take normal level classes – in fact, I’m not sure if there were any computer science related classes at my high school,” Choontanom said. Despite not having had any formal computer science training, Choontanom found the CSE curriculum provided her a strong foundation that she can build on during her career. Check out our spotlight page to read more profiles of Bren School students, faculty and alumni. The CSE program also provides students a chance to gain a better understanding of the hardware side of computers too. UCI has also provided Choontanom opportunities to get valuable real world work experience to enhance what she has learned in the classroom. For the past year, she has been a web intern for University Communications and works on the uci.edu web page as well as other UCI department and program web pages and has developed an RSS feed for the ZotWire news site. Working for University Communications has allowed Choontanom to interact with students from various majors and the interdisciplinary interaction has helped expand her knowledge beyond the realm of computer science. “It's nice to talk to people from other majors because they'll sometimes off handedly mention things you never knew before, but seems like common knowledge to them,” Choontanom said. She is also conducting undergraduate research with professor Bonnie Nardi on the concept of build theory in Massively Multiplayer Online Games (MMOGs) like World of Warcraft. 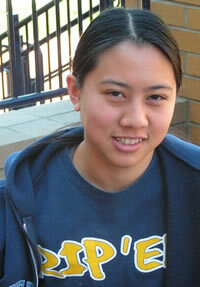 During her sophomore year, Choontanom joined UCI’s Women in Computer Science (WICS) group, an organization established to help and encourage women to pursue a college degree and a successful career in the Computer Science fields. She was encouraged by her mentor at WICS to apply for an officer position and her junior year she became the WICS Secretary. The position provided her an opportunity to encourage other young girls to pursue a career in the field of computer science. The CSE program has been a challenge for Choontanom and she has had more of her fair share of late nights in the lab with some of her CSE friends and teammates. But these late nights can lead to moments of levity, like when her group performed an impromptu magic trick late at night while trying to finish difficult homework and labs. be involved in sports and other clubs, and party,” Choontanom said. Choontanom likes to relax and unwind by taking a Filipino Martial Arts at the Anteater Recreation Center or indulging in her hobbies of web development and design and watching anime or reading manga. Every now and then she’ll pick up her violin and play for a few minutes, or mess around with a little gymnastics. “Since school has been a kind of straightforward, driven path, my hobbies have taken the polar opposite by fueling my imagination for creativity in various form of arts,” Choontanom said. With graduation fast approaching, Choontanom is still unsure of whether she wants to go on to graduate school or enter the work force. But she is certain of one thing, she has loved her time at UCI and has made many life long friendships. And to those students considering pursuing computer science at UCI, she offers this advice.